China National Offshore Oil Corp, a leading domestic oil and gas producer, will expand its presence in the offshore wind sector this year to develop its clean energy portfolio, following its involvement in a related project in East China's Jiangsu province in January. The offshore wind sector aligns with the company's overall business, given its resources in offshore engineering and experience in offshore operations, which it can directly apply in the sector, said Yuan Guangyu, CEO of CNOOC Ltd, the company's upstream listed arm. CNOOC has vowed to steadily increase its reserves and production of oil and gas this year, aiming to produce 480 million to 490 million barrels of oil equivalent in 2019. It is forecast to report its 2018 production of approximately 475 million barrels of oil equivalent. The company first entered the offshore wind business in 2006. In 2007, CNOOC began operating the Chinese mainland's first offshore wind power plant, located in Liaodong Bay in the Bohai Sea, with an installed capacity of 1.5 megawatts. However, the company closed its renewable energy unit in 2014, which had operated wind, solar and biomass projects. CNOOC's current Jiangsu project is the first offshore wind project it has worked on since then. Analysts said the company's transition back into the field aligns with the government's recent efforts to promote renewable energy, as the country is taking bold steps to replace fossil fuels with clean energy sources, especially wind and solar power. The domestic wind and solar sector will experience a strong growth in the period between 2020 and 2030 due to declining costs, according to the China Renewable Energy Outlook 2018, released by the China Renewable Energy Engineering Institute, a think tank linked to China's National Energy Administration. The nation's installed wind power capacity will increase 70 to 140 gigawatts every year, and wind and solar power will comprise the absolute majority in China's energy mix by 2050, according to the report. Progress toward using more clean energy has been accelerating over the past few years, and this trend will remain unchanged in the short-to-medium term in China, said Joseph Jacobelli, a senior analyst of Asian utilities and infrastructure at Bloomberg Intelligence in Hong Kong. Jacobelli said despite the high cost of offshore wind farms in China, which is twice or three times that of a plant with the same capacity on land, the cost should come down in the next few years, becoming comparable with solar and onshore wind facilities. China has vast wind resources, both onshore and offshore. The country plans to install 5 GW of offshore wind capacity by 2020, and build seven large-scale wind power generation bases in Gansu, Hebei, Jilin and Jiangsu provinces, and the Xinjiang Uygur and the Inner Mongolia autonomous regions in 2020, in a bid to boost clean energy resources. In addition to CNOOC, other domestic entities have also been embarking on offshore wind power projects. China Three Gorges Corp started work on several offshore wind farms last year. CGN New Energy Holdings Co Ltd, a subsidiary of China General Nuclear Power Corp, also kicked off construction of the country's largest single offshore wind project in October. Located off Nanpeng Island in Yangjiang, Guangdong province, the facility will have a total installed capacity of 400 MW. It is scheduled to connect to the grid and start generating power by 2020. The project will see a yearly generation capacity of 1.47 billion kilowatt-hours, according to CGN New Energy. 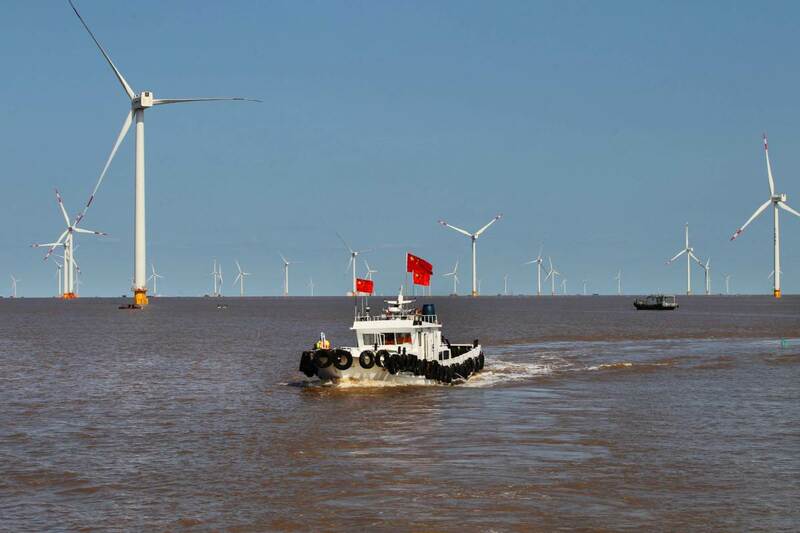 The Jiangsu provincial government has approved 24 offshore wind power projects with a total capacity of 6.7 GW to date. All the projects are set to be completed before the end of 2020.